My works and curiosities will be available to see and some to buy at the Limbo Beach Hut Museum and Print Station at the Art Car Boot Fair, Margate. Lured by the sea, the light, the tradition, the eccentric and the eclectic and thanks to the generous invitation of Turner Contemporary, we will be rolling into town this August Bank Holiday with the artworld’s most exuberant event. 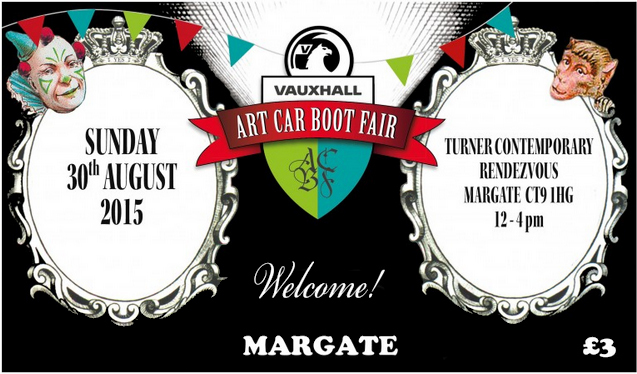 Margate, former home and inspiration to both Turner and Emin, quintessential seaside town and freshly buzzing with vibrancy and a sense of adventure – it’s the perfect place to bring the Art Car Boot Fair! 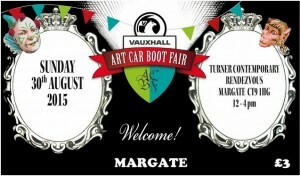 Our car boots will overflow with local and London talents including exciting new collaborations with Margate based independents, Resort, Crate and Limbo and many other individual artists and performers who’ll bringing beach huts, matt black caravans, The Kent Cultural Baton, an ex-Nato campervan turned Camera Obscura, maybe the odd Bathing Machine to boot….plus a full 3 hour cabaret from Cabaret Futura’s inimitable Richard Strange and there’ll be lots of random performances and happenings besides…and fresh from success at our London event in June we’re delighted to bring The Dog in a Vintage Vauxhall Viva Boot Show!